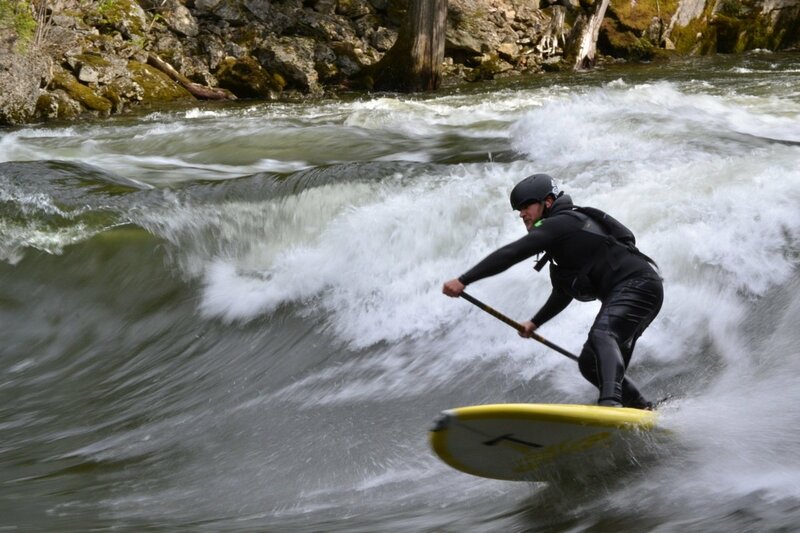 Lochsa’s Pipeline is one of the premier river surfing waves in the United States. With the right flows, it has a big, dynamic face that will give up big rides all day long. It’s one of the most ocean-like river waves out there, with a glassy left and a breaking peak. It’s also in a beautiful canyon on Idaho’s Lochsa river. The only catch is that if it’s in, you may be competing with kayakers and other river users for wave time. Big flows over 13,000 cfs are going to lead to pushy conditions and demanding swims on this big water feature. Watch out for strong currents and debris, particularly at high water. The Lochsa River near Lowell ID gauge gives an accurate flow for the wave. If people are discussing a gauge in feet, they’re talking about a foot gauge on the bridge near Lowell. But don’t confuse the USGS gauge with the foot gauge. If you’re looking at the CFS USGS gauge, best flows are between 4,500 and 16,000 cfs. Also look here for flow predictions. Get yourself onto Highway 12 near Lowell, Idaho. You’ll find a pullout on the east side of Highway 12 near mile 113.5; that’s your ticket to the main event. Good camping is easy to find nearby.